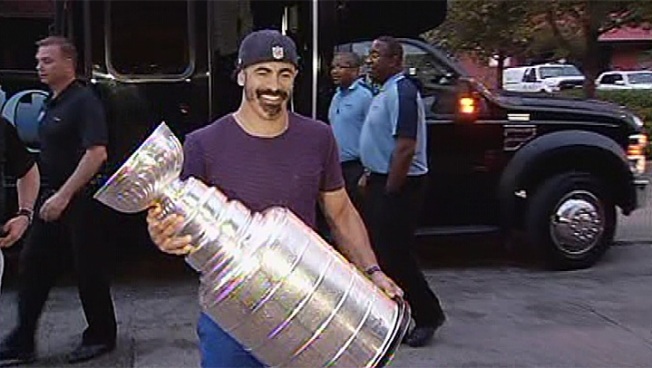 It's been a few years since the Stanley Cup has done a Chicago bar crawl, so the Blackhawks were more than happy to show him the sights on Tuesday night -- and early Wednesday morning. Overall, Tuesday was quite the busy day for Lord Stanley since arriving early in the morning, but after a well-deserved early-evening break, the Stanley Cup showed up at Market Bar in the West Loop at 8 p.m. -- accompanied by several Blackhawks players in a couple of party buses. "I got a couple hours (sleep) so I'm not too beat up. Voice is a little beat up, but that's about it," Viktor Stahlberg told NBC 5. After checking out the scene on the rooftop deck, it was on to River North's Rockit Bar & Grill at about 10 p.m., where police cordoned off the area of Hubbard Street in front of the building to acommodate the throngs of Hawks fans who showed up to get a glimpse of the Cup and their favorite players. The team partied on the top floor with Rockit Ranch CEO Billy Dec, and interacted with the fans below by spraying beer and champagne through the open windows and hoisting the Cup for everyone to see. The party continued until at least 3 a.m., with a quick stop at Bub City and nearby nightclub American Junkie. The Cup went home for some rest, but the players continued on to Boardroom nightclub, where Jonathan "Captain Serious" Toews was seen engaging in a little bit of crowd-surfing. Finding out where the team was going to show up turned into a game of cat-and-mouse on social media. Many fans were sure the Cup was going to show up at Lincoln Park's Stanley's Kitchen and Tap and waited for hours to no avail. Same for Lakeview's The Pony, who were hoping for an early-morning appearance, and Rock Bottom Brewery, which also didn't get a visit. But keep in mind, there's plenty of time left before announcing last call on this celebration. Use the #FollowTheCup hash tag on Twitter to find out the Stanley Cup's latest location or to report your own findings.